In 1411, Donald, the Lord of the Isles, supported by various Island and Highland chieftains marched on Aberdone (or Aberdeen as it is now called). It was a time of great unrest. When the Scots were not fighting the English, they fought each other. James I, a boy of seven years, on his way to the sanctuary of France, had been captured by the English. To add to the confusion, the boy King had not been anointed and crowned as the Scottish sovereign. His uncle, the Duke of Albany, had been named regent and the Duke took upon himself many of the prerogatives of a king. Albany had awarded the Earldom of Ross to his son, John, Earl of Buchan. That move was challenged by the Lord of the Isles who claimed the Earldom of Ross by right of his wife. Donald had swept all opposition aside as he fought his way across the north of Scotland. He had sacked and burned Inverness. He had captured Dingwall. The plunder of Aberdeen was the next prize he offered his men. By seizing the sheriffdoms of Banff, Aberdeen and Kincardine, the Lord of the Isles would have made good his bid to the Earldom of Ross. With the desperation of men with nothing to lose, the Aberdonian burgesses, supported the local lairds and led by Alexander Stewart, the Earl of Mar, met Donald and his host at Harlaw, a league or so to the northwest of the City. The aggressors outnumbered the defenders, ten to one. The Earl of Mar, however, had one advantage. Some of his men bore armour. Mar placed his iron-clad men foremost in the bloody battle that followed. These men stood firm with spear, battle axe and sword in the face of the onslaught. Even though they were engulfed by the enemy, they fought until nightfall. As the dawn rose on the sorely depleted Aberdonians and their allies, they found themselves alone. Only the dead and dying surrounded them. Donald and his men had fled the field. It was one of the bloodiest battles ever fought on Scottish soil. The blood drenched ground caused it to be called, thereafter, "Red Harlaw." It is likely that one of the surviving warriors was Thomas Kynidy. The Charters of Ellon recorded that Thomas Kynidy, Constable of Aberdeen, purchased lands at Ardgith and resided there, in a tower-fortalice from 1413, just two years after the Battle of Harlaw. It was, most likely, the Royal Regent, the Duke of Albany, in the absence of James I, who saw fit to bestow the hereditary Constableship of Aberdeen on the valorous Kynidy for action that helped to thwart the aims of Donald, the Lord of the Isles. The origins of the Kennedys are lost in the mists of ancient Scottish History. Among the first recorded, was Gillespie McKenedy, steward of Carrick in the 13th century. Another Kennedy, John, married an heiress of Dunure and a descendant of his became the Earl of Cassilis. Thus they came to own extensive lands in Ayr and adjacent shires. They were identified by their properties of Dunure, Drumellan, Colzean, Girvanmains, Bargany and others. Collectively, they were known as the Carrick Kennedys. It is interesting to note that the father of Robert the Bruce of Scotland, married the Countess of Carrick. Thus, Robert I was part Carrick. Most of the Lowland nobility of Scotland at that time were Norman. However, Robert de Brus could claim a connection with the ancient race through his mother. Whether Thomas Kynidy, or one of his antecedents, was a member of the Carrick families is not known. It has been suggested that he was. The cross-crosslet of the Lords of Carrick was also used on the shields of the Kennedys of Kermuck as the descendants of Thomas Kynidy came to be known. It has also been suggested, that since Robert I, the Bruce, had granted lands and titles in Aberdeenshire to followers who had assisted him in his struggle for the Crown of Scotland, there was a possibility that a Carrick Kennedy might have participated in such rewards. Alexander Scrymgeour, who bore the Royal Banner in the Army of Scotland was appointed Hereditary Constable of Dundee in 1298 by Sir William Wallace, which office was held by Scrymgeour's heirs down to 1746, when it was abolished, along with that of Aberdeen and other hereditary jurisdictions in Scotland by Act of Parliament in 1746. In view of Robert the Bruce's Carrick connection, the office might have been bestowed by the Crown for distinguished service. Thus, the title might have been held continuously for at least 350 years by a family known since 1564 and, probably earlier, by the name of Kennedy. In any case there is documented proof that this family held that honor for 250 years from the time of Thomas Kynidy in 1413. In a Charter in his wife's favour in 1450 the Constable of Aberdeen's name appears as Thomas Kynnedy. In the same year a new Constable of Aberdeen was named as Duncan Kympty. In 1483 in the records of the courthouse of Aberdeen there is mention of William Kympty, Constable, appointing a deputy to act in his place. The same William Kympty is referred in the Charters of Ellen in 1495 as being in possession of the lands of Carnmuk and others in the parish of Ellon. Again, in the records of the Court of Aberdeen the death of William Kympty, or Kymdy is recorded in 1505. His son William Kempty is recorded as Constable of Aberdeen in 1505. This second William held the position for thirty-eight years and died in 1543. During the time of these two Williams, we find an Andrew Kempty as a Factor in Orkney in 1484 and subsequently a Gilbert Kempe also as a Factor in Orkney in 1498. The same Gilbert is recorded in 1514 with a surname spelled Kynidy. Whether they were a branch of the Aberdeen Constables is not known. In the Charters of Ellon, to return to those Kennedys of Aberdeen that we are interested in, we find that in 1543 John Kemptie or Kympty and his spouse, Marjory Cheyne of Eselmont were invested with the lands of Carnmuk and others, in succession to his father William Kympty, deceased. 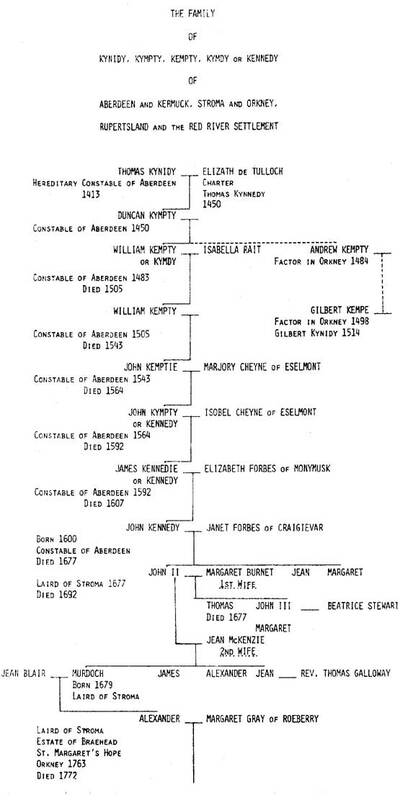 John Kympty died in 1564 and his son also named John succeeded him. This John was married to Isobel Cheyne of Eselmont. The Cheynes were a powerful family of the area and held the Barony of Eselmont. In 1591, a royal charter was issued to John Kennedy of Carmuck and James Kennedy, his son, for a half net's fishing on the Dee. The father died in 1592 and James Kennedie, or Kennedy, succeeded to the Hereditary Constableship of Aberdeen. He was married to Elizabeth Forbes, the daughter of the Laird of Monymusk. The Charters of Ellon indicate that James died in 1607. (From the foregoing, it will be noted that the John Kympty who became Constable in 1564 was also referred to as John Kennedy. The spelling of the name seemed to depend upon the scribe). His son, John Kennedy was born in 1600. After the death of his father, his mother remarried in 1609. Her second husband was Alexander Annand of Auchterellon, a neighboring Barony. John Kennedy succeeded to the Constableship of Aberdeen and was the Laird of Kermuk. As such, he was the owner of extensive lands which included a number of farms - Knockothy, Clayhills, Kirkhill, Boroughley and others. He had been, it is thought, brought up under the guardianship of his grandmother Isobel. That worthy old lady continued to reside with him until she died. In 1636 Isobel Kennedy executed a deed by which she bequeathed 1,000 Merks to the poor of the land of Kermuckes. The interest of this legacy continued to be distributed until recent times. The grandson came to be known as John of the Great Sword. John Kennedy married Janet Forbes of Craigievar in 1624. He was, through his mother and his wife, connected with the strong Forbes clan that held lands extensively in the west of Aberdeenshire. They were Covenanters and feuded, continually, with the powerful House of Gordon, headed by George Gordon, Marquis of Huntly, who was a Royalist when it suited his purposes. In his youth John Kennedy had been suspected of leaning towards Roman Catholicism. His father had been excommunicated by the Reformed Brethren for holding anti-Protestant views. John Kennedy proved his support of the Reformed Faith (Episcopalian). The Charters of Ellon indicate that he gave a Communion Cup to the Church of Ellon in 1634 on behalf of his spouse and himself. Furthermore, he was an elder of that church and as such attended the General Assembly in Glasgow in 1638. It was the scene of a struggle for power between Charles I, on the one hand, and the Presbyterian Ministers and lay members of the Covenant, on the other. Kennedy considered this opposition to the King disloyal. He left the Assembly and withdrew from the Church. In 1639, he was visited by a Special Deputation of the Presbytery which urged him to abandon the Royalist Party, to join the Covenanters and to resume attendance at the Church of Ellon. He refused. Perhaps, the blasphemies committed in the name of religion such as the slogan "Jesus and No Quarter" and the resultant killing did not sit well with John Kennedy. Nevertheless, eventually, he changed sides. Subsequently, Sir John Gordon of Haddo, a royalist, came to Ellon and plundered him and his tenants. In the spring of 1644, the same Gordon, impatient at the failure of his chief, the Marquis of Huntly, to support the King's forces, again, raided Aberdeen and kidnapped the Provost. This prompted Huntly to occupy Aberdeen. In the meantime, the Royalist depredations had caused the district to become a Covenant stronghold with John Kennedy as one of its boldest leaders. He had become a member of the Committee of War and had been active as such in 1642-43. He was taken prisoner when Aberdeen was captured in 1644. The city changed masters several times. In 1646, John Kennedy was again a member of the Committee of War. His Gordon enemies were brought to heel by the Covenant forces. Sir John Gordon of Haddo has been captured not long after his triumph at Aberdeen in 1644 and executed by order of the Earl of Argyll. George Gordon, the Earl of Huntly, was taken prisoner in Aberdeenshire, in 1649, and, shortly, died on the scaffold in Edinburgh. Scotland was in the hands of the Solemn League and Covenant. Charles II was in exile and a deputation, led by another John Kennedy, the VIth Earl of Cassilis, was sent to meet with their sovereign, in the Hague. Cassilis was a stern, religious man, referred to as "the Solemn." This highly placed Kennedy exhibited traits of zealousness that later appeared to a marked degree in a descendant of the Kermuck Kennedys, Captain William Kennedy. The efforts of the Earl of Cassilis were in vain. The Earl of Montrose was sent to retake Scotland for the Royalists. The Orkneys were an important base for the king's army but the attempt was doomed. The Earl of Montrose died on the scaffold in May 1650. Charles II landed in Scotland in June 1650 on the Covenanter's terms. Charles was crowned at Scone in 1651. The King and the Covenanters were soon defeated by Oliver Cromwell. Charles II fled to exile in Holland again. Against this historical backdrop, the fortunes of the Kermuck Kennedys took a sudden downturn in 1652. The tower fortalice of these Kennedys looked down from the hill of Ardgith upon the ancient village and Kirk of Ellon. Part of the land was a marsh and the Kennedys wished to drain the area. A ditch had to be cut across a public road. The Forbes and other neighbors objected. On the 12th February, 1652, the Forbes and others, with Bruce, sheriff clerk of Banff, made a legal protest. Bruce was armed with a sword and pistols. The Kennedys persisted in digging the trench. On the 13th February, "the Slaughter of Watertown" occurred. The Kennedys, with a total party of seven, had continued their project. Forbes of Watertown confronted them with a party of 23 men, 13 armed with swords and pistols and 10 with spades, shovels and stones. However, the Kennedys were not cowed by the Forbes' show of strength. According to the Watertown Papers, "the said laird of Carmucks, with his son and other assistants, did wound the said Thomas Forbes dangerously on the head, Alexander Bruce on the head and left arm, and a man-servant was shot through the body." After severe fighting had taken place, the minister, at great risk to himself, rushed between the combatants and succeeded in keeping them apart for six or eight minutes. The senior Kennedy was inclined to make peace with his old friend Forbes but the younger John Kennedy was aroused and declared that he would not leave, "until the last of the Watertown men should be within their own yett." John of the Great Sword, as the elder was called, had his jaw broken and three teeth knocked out by a stone thrown by one of the Forbes adherents. This caused the elder Kennedy to go berserk. He struck the Forbes of Watertown such a blow on the head that the latter died four months later. The attackers were driven off. The Kennedys, in spite of their fewer numbers, were the better fighters and won the day. The combatants were required to appear before the courts in Edinburgh. John Kennedy, the elder, and one of his principal opponents, Alexander Forbes of Craigie, were jailed for taking the law into their own hands. John of the Great Sword escaped from prison while his enemy languished in jail for seven months and was heavily fined for the attack on the Kennedys. The Kennedys of Kermuck were required to appear for trial on the 15th October, 1652. They did not comply with the court order and were outlawed. In the usual course of events, their lands and possessions should have been forfeit. They must have had powerful friends for they were not apprehended and they were allowed to sell their property through the intermediary, John Moir, to John Forbes, son of the deceased Watertown, for 42,500 Scots pounds. The Kennedy wives continued to live in the Ardgith Castle until 1657. In the meantime, the two Johns had gone north to Caithness where George St. Clair, 6th Earl of Caithness, granted them a wadset of the Island of Stroma. The Kennedys were the proprietors of the Island of Stroma for three generations. The younger John had apparently received medical training as he was referred to in the diary of Bishop Forbes as Doctor Kennedy. In 1677, the year of his father's death, John II acquired the Gallery, an old house, in Kirkwall. He married Jean Mackenzie, the Bishop's daughter, and the wedding reception took place in the banquet hall of the Earl's Palace. He died in 1692. His eldest son, Murdoch, by this second marriage, became the Laird of Stroma. He was a wild and irreverent man. The remains of his father and grandfather, entombed in the Stroma Tower, became mummified, probably by the salt spray of the wild storms of the Pentland Firth. There is a tradition that Murdoch often entertained guests by showing them the mummies of his predecessors and, on these occasions, was described as acting in an eccentric manner. He also contracted debts which resulted in litigation. He married Jean Blair and was succeeded by his son Alexander. Alexander married Margaret Gray of Roeberry. He purchased Braehead in South Ronaldsay. The estate was enlarged with the purchase of other farms. He died in 1772 and was succeeded by his son James. James married Isabella Gray. He was the proprietor of Braehead. He did not have the initiative of his father to expand the fortunes of the Kennedys. Of the four known children of James Kennedy and Isabella Gray, Alexander was the venturesome one. Alexander was born in 1781. At the age of seventeen he joined the Hudson's Bay Company and came out to York Factory in 1798 as a writer. He sailed in the Company's ship King George. He remained at the York Factory for six years. For the season of 1804-1805 he served as master of Cumberland House and was in charge for the following season. During this time he had married Aggathas of the Swampy Cree Tribe, or the Ethinyoowuc as they called themselves. Since there was no clergyman, the marriage was "in the manner of the country." Two sons, John Frederick and William, Jr., were born at Cumberland House. In rapid succession he was in charge of Moose Lake of the same area, Brandy or Drunken Lake in the Poplar River area, Swan River, Brandon House, Swan River, Red Deer River where he built a post, and, finally, Cumberland House again. In the previous year, 1813, he had, in the manner of his ancestors, fought a battle, sword in hand, with a partner of the Northwest Company. He and his opponent were wounded in the process. From 1814 to 1819 Alexander Kennedy was Chief Factor of the Cumberland House district. In the autumn 1819, he proceeded to Britain on the company ship Prince of Wales. He was accompanied by his sons John and Alexander. He put the boys into school at St. Margaret's Hope in South Ronaldshay, Orkney. He returned on the Eddystone the following summer and took charge of Norway House. In 1821, he was one of the ten Chief Factors of the Hudson's Bay Company who signed the deed poll of union with the Northwest Company. He was seated opposite his old enemy, "Blind" McDonald of the Swan River duel. After being appointed a Counsellor of the Governors of the Territories of the Hudson's Bay Company on May 29, 1822, he proceeded to the Columbia Department to take charge of Spokane House. The following year he proceeded to Fort George, at the mouth of the Columbia River, where he assumed command of the district upon the departure of Chief Factor John Dugald Cameron. In the spring of 1825 Alexander Kennedy relinquished command to Dr. John McLoughlin but not before he had chosen the site of Fort Vancouver on the north bank of the Columbia River. Governor Simpson who had come to the Department in November 1824 had assumed that negotiations between Britain and the United States would result in the Columbia River forming the division between the British and American jurisdictions on the Pacific coast. As Fort George was on the southern bank of the river a new headquarters had to be built. Thus, Alexander Kennedy chose the site of what is today Vancouver, Washington. In 1825 Alexander Kennedy went on leave to Britain for a year. Once again he took his sons who were of age with him to put them into school in Orkney. This time it was the turn of William and his brother George. In the summer of 1826 Alexander Kennedy returned on the H.B.C. ship Camden to Moose Factory. He was in charge of Albany for the next three seasons. He retired from the service of the company in 1829 and proceeded to Britain in the Prince of Wales. He returned to the Red River settlement in 1830 and was listed in the census of May 31, 1831, as living with his family in the settlement. In the fall 1831, he went to Britain again. In a letter of 1832, he referred to the Swiss cottage on their property and hoped that Thomas Isbister who had married his daughter Mary would settle on the land immediately down river. He died while visiting in London on the 6th of June, 1832. He was buried in the vault of St. Mark's Church, Pentonville, London. He was a wealthy man having shared in the profits of the company as a Chief Factor. He left an annuity to his wife and each of his children. His Indian wife Aggathas, or Mary Bear, as she was also known, received title to their property in 1833 from the Hudson Bay Company. Aggathas continued to live on that property by the Grand Rapids of the Red River until she died there in 1863. Of the nine children born to the Kennedys, two became physicians, one was a schoolteacher, one was the proprietor of a store, one was involved in business, one was an Arctic explorer and lobbyist for Canadian expansion and two had famous children, in terms of the province of Manitoba. John Frederick Kennedy was born at Cumberland House in 1805. He was educated in the Orkneys and Edinburgh, Scotland, as a doctor. In 1829, he was engaged as surgeon on land or afloat in the Columbia district. Subsequently, he served as a doctor in various posts where he was also qualified to act as trader, store-keeper, and accountant. He was appointed as Chief Trader in 1847. He married an Indian woman of the Fort Simpson district and had several children. He retired in 1856 to Victoria, Vancouver Island. He died there on April 3, 1859. Alexander, Jr., was born in 1806 at Moose Lake. He was also schooled in the Orkneys and was a schoolteacher at St. Andrews, Manitoba. He was a clerk of the vestry at old St. Andrew's Church and some of his precise handwriting still survives in the church records. He was said to have been very much a gentleman and an accomplished violinist. The next child, Mary, was born in 1807 at Brandy Lake. She married Thomas Isbister in 1821. She had a daughter and a son before her husband was killed by a bull. Her son Alexander Kennedy Isbister was educated in the Orkneys as were his uncles. He returned to serve the Hudson Bay Company in the MacKenzie Valley for three years. He left the H.B.C. service to upgrade his education in the Red River settlement and, thereafter, went to Edinburgh where he earned an M.A. By the time his uncle, William Kennedy, came to London in 1851 Alex Isbister was the headmaster of the East Islington School. He became a member of the College of Perceptors who set the standards for education throughout the British Isles. He earned an L.L.B. and was a barrister of London, England. He wrote twenty-one educational books in his lifetime. When he died in 1883, he left the equivalent of $83,000 to the infant University of Manitoba which was used to institute the Isbister scholarships of the province of Manitoba. Elizabeth was the next child born to the Chief Factor and his Indian wife. She was also born at Swan River in 1809. She was married at Albany Factory in 1826 to Nicol Finlayson, who became the Chief Trader of the company. He was very fond of his wife, Betsy. Nicol Finlayson's wife was of half blood, and the Reverend James Evans wrote of her, "Mrs. Finlayson is a very fine little woman, the daughter of a former Governor of the Hudson's Bay Territory. She is half Cree but speaks excellent English and is quite the lady." Thus the true picture of these gentlemen's "wives of the country" is not altogether as the novelist paints it, that of a squaw cowering under her shawl. Many of these women, when given the opportunity, became ladies in their own right. The fifth child, was William, born at Cumberland House in 1814. During the absence of his father in 1819, young William was treated to the unusual event of the arrival of Sir John Franklin and his party in October. The young explorer amused himself by teaching the children at the post their first reading, writing and arithmetic during the months that he stayed there. Billy Kennedy was not to forget this mentor of his early childhood. In 1825, Billy accompanied his father on the company ship from York Factory through the Hudson Bay, the Hudson Strait, and across the North Atlantic to the misty Isles of his father's Orkney homeland. He would have seen The Old Man of Hoy and the ancient Port of Stromness where a well on the waterfront is still marked as a source of the last fresh water to be taken aboard ships bound for the Hudson Bay. He was sent to school at St. Margaret's Hope, South Ronaldshay. The stone houses of that town have not changed much in the intervening years. Braehead, the family property on a hill overlooking the town and the bay, also shows little change. In 1833, the year after his father's death, William Kennedy asked to be allowed to study medicine. William Smith the executor of the estate and secretary of the Hudson Bay Company, refused his request and offered him an apprenticeship in the fur trade. William returned to serve the company for five years in the Ottawa valley where he perfected his command of Canadian French. He was posted to Port Chimo in 1838. He travelled through unknown territory and served at various places in what is now northern Quebec and Labrador. He left the company in 1846 and spent the next four years in upper Canada lobbying against the continued regime of the Hudson's Bay Company in Rupertsland and the additional territories of the North and the West. In 1851 he commanded an expedition in search of Sir John Franklin who had become lost looking for the Northwest passage. He wintered his little ship, the Prince Albert, on the east coast of Somerset Island and made an 1100 mile trek into unknown territory with a small party of men which included his second-in-command, Lieutenant Joseph Rene Bellot. He discovered a strait which marked the northernmost tip of the North American Continent. He named it the Bellot Strait. He returned to Britain in the fall of 1852 and commanded a second ship around the Horn to Valparaiso. His crew was not of the calibre of his first and the voyage terminated there. He returned to Canada in 1856 and took up his lobby against the H.B.C. He came to Red River in a month and five days in the winter of 1857. He held meetings against the company and returned with a petition signed by almost 600 residents of the settlement who requested union with Canada. He returned to Britain to marry Eleanor Eliza Cripps who is said to have been a kinswoman of Lady Franklin. They came to Red River in 1860. In 1866 he built Maple Grove and lived out the rest of his life in the west. He died in 1890. He was survived by his wife, his daughter Mary and his son William. Mary was an author and a painter. William Jr. was a good scholar and worked in the land titles office at Virden and Brandon, Manitoba. The daughter never married. The son married late in life. Thus there were no direct descendants of William Kennedy and his wife. George Kennedy was born, in 1815, at Cumberland House and accompanied his father and older brother, William, to the Orkneys in 1825. He was schooled at St. Margaret's Hope and returned to North America in the 1830's. For many years he was the proprietor of the store on the river road in St. Andrews not far from Maple Grove. He was listed in the census of 1870 as an English half-breed living in St. Andrews. He was unmarried. He died in 1896. Phillip Kennedy was also born at Cumberland House, in 1816, and schooled in the Orkneys. In 1833, he was listed, along with his mother Aggathas, in the Register of Land Grants of the Hudson's Bay Company, as a recipient of property at St. Andrews. He married Jessie McKenzie and had twelve children, several of whom died in infancy. A review of the names of the people the children married reveals old Hudson Bay and Red River settlement names such as Inkster, Ross and Pruden. Phillip engaged in business and was a member of the Masonic Order. He died in 1873. Isabella Kennedy was probably born in 1820 and she married George Setter. Initially, the couple lived on the banks of the Red River at Park's Creek. Their daughter Elizabeth was born there. Subsequently, they moved to Portage la Prairie. It was there that their daughter married a struggling young schoolteacher John Norquay. John Norquay also came from old Rupertsland stock. He was a good student and at seventeen was master of the parish school in St. James. After his marriage to Elizabeth Setter they farmed at High Bluff, did some fur trading at White Horse Plains and farmed again as that was more remunerative. For a time, he was sheriff of the central judicial district of the province. When the first legislature of Manitoba assembled in 1871, John Norquay represented the constituency of High Bluff. He was in the government until 1887 and for twelve of those seventeen years he was Premier. He was the first citizen born in the province to become Premier. For a time he represented St. Andrews south and lived in that district. This was, perhaps, influenced by the fact that his illustrious uncle, by marriage, Captain William Kennedy, was a respected citizen of that community. They had eight children: five boys and three girls. After 1880 the Norquays lived in the northern part of Winnipeg. John Norquay died at the age of 43. In 1908, Mrs. John Norquay came to live at the old house of her uncle, Maple Grove, at St. Andrews. Her son-in-law, John McAllister, had bought the property and renamed it Dun Allister. She lived quietly on the banks of the Red River, not far from where she had been born. In the early 1920s she was interviewed by W. J. Healy for the book Women of Red River which had been commissioned by the Women's Canadian Club. In that book, the chapter on St. Andrews, begins with a description of the house and with the fact that the widow Norquay lived at Dun Allister. She died at the age of ninety-one in August, 1933. She was survived by her five sons: Thomas in Arizona; John G., St. Andrews; Alex., Edmonton, Alberta; Dr. Horace C., Battleford and Andrew J., Saskatoon and her daughter, Ellen, of St. Andrews, Manitoba. She had been predeceased by her daughters Isabella and Ada. The McAllisters continued to own the property until 1946. 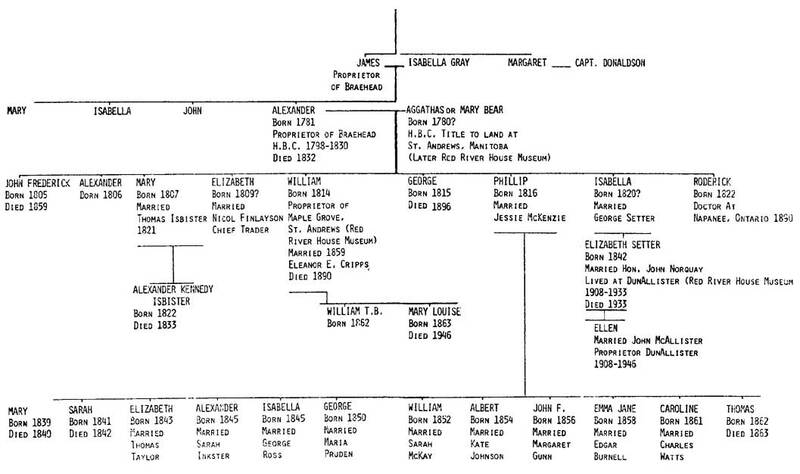 Thus there was a family connection between the first owners, the Kennedys, and the third owners, the McAllisters. Roderick Kennedy was born in 1822. He was also schooled in the Orkneys. He served the Hudson's Bay Company in the fur trade for a time. He was trained as a physician and letters from his older brother William Kennedy survive in which the Captain urges his younger brother to complete his training. Roderick did so and was listed in 1890 as a Health Officer at Napanee and Bath in Ontario and as a practising physician at Bath. The first two generations of the family in Canada have left their mark, in various ways mentioned, throughout our nation. The contribution of this unusual western family, in Manitoba, has been significant. The memory of the Kennedy origins and accomplishments will live on in the old stone home, now called Red River House Museum, for the present and future generations to contemplate. The paper was illustrated with 60 coloured slides. Bibliography available from the author. The author wishes to express his gratitude to the following for their help during the researching of this paper: Mr. John Maclntyre, formerly President of the Rupertsland Trading Company, and Vice-President of the Hudson's Bay Company; The Hudson's Bay Company and its archival Staff, Beaver House, London, England, and Hudson Bay House, Winnipeg; Mr. John Bovey and Staff, Provincial Archives of Manitoba; Miss C. Combaz and Staff, Provincial Library of Manitoba; The Public Records Office, London, England; The National Portrait Gallery, London, England; The Scott Polar Research Institute, Cambridge, England. Mr. Allan Cooke, Curator of Manuscripts; Mr. & Mrs. A.D. Ormond, Caterham, Surrey, England; Mr. & Mrs. A. Sim formerly of Pettswood, Kent, England; Mr. James Munro, Skerray, Sutherland, Scotland; Mr. Gordon Burr, Tongue, Sutherland, Scotland; Mr. James Sinclair, Kirkwall, Orkney, Scotland; Mrs. Goodsir, St. Margaret's Hope, Orkney; Dr. Allan Burr, Aberdeen, Scotland; Mr. E.R. James, Grosse Isle, Manitoba; Mrs. Mary Savage, Winnipeg, Manitoba.